Born and raised in Albany, Dr. Richter graduated with a B.A. from the State University of New York in 1969. He completed his dental studies at Fairleigh Dickinson University, graduating with a D.M.D. in 1973. He was recognized by the International College of Dentists for outstanding achievement at Fairleigh Dickinson. Upon graduation, Dr. Richter continued his education as a General Practice Intern at the Albany Medical Center Hospital, Albany, New York. Upon completion of this program he relocated to South Florida to practice dentistry. 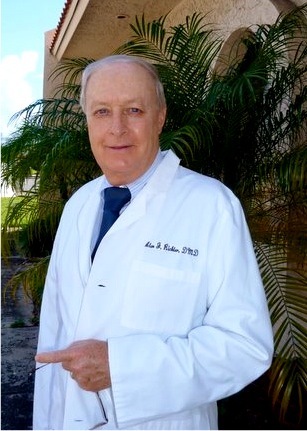 Dr. Richter has been in continuous dental practice in South Florida since 1974. He is a member of the American Dental Association, Florida Dental Association, East Coast District Dental Society and the South Broward Dental Association. He actively pursues continuing education coursework in the most current restorative dental procedures through these professional organizations. Caring for our community goes beyond dental care in the office. Your doctor has been an active member of The Hollywood Rotary Club since 1980. The Hollywood Rotary Club is dedicated to community improvement, educational programs, and provides assistance and scholarships to local eligible college bound students. Dr. Richter is a Spanish language student and his staff is officially bilingual. Dr. Richter is happily married with two daughters- one an active attorney and the other a professional vascular ultrasonographer. Boating is a lifelong interest. He sails in his free time and holds a US Coast Guard Captain's License (Master). He also holds a nautically inspired registered patent with the U.S. Patent and Trademark Office. Dr. Richter's Office Staff are of the highest quality. They will make you comfortable, maintain your privacy, and assure you of the most expeditious access to our office when you are in need. Their mild manner and professional integrity will immediately set you at ease. As with Dr. Richter, the entire staff maintains the highest levels of accreditation and continues to stay abreast of the latest trends in office management and patient care.